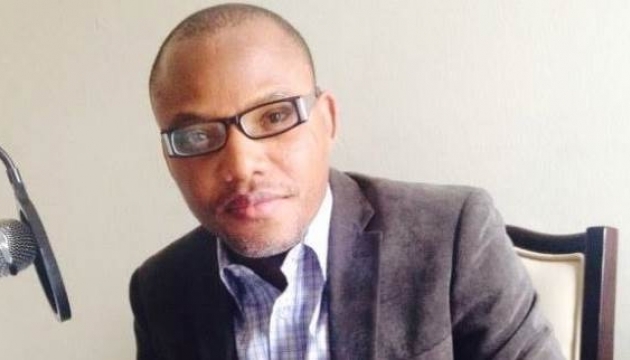 The Court of Appeal in Abuja has affirmed the decision of the Federal High Court to deny a bail application by the leader of the Indigenous People of Biafra, Nnamdi Kanu. Mr. Kanu is facing treason charges, alongside two others, Benjamin Madubgwu and James Nwawuisi, at the Federal High Court Abuja. Mr. Kanu had on May 5 approached the appeal court through his counsel, Chucks Muoma, challenging the decision of the Federal High Court to deny him bail. Mr. Muoma had asked the court to determine whether the ruling by Justice John Tsoho of the Federal High Court was not an aberration of Mr. Kanu’s fundamental rights as stipulated in the Constitution. Mr. Muoma also prayed the Appeal Court to determine whether or not Mr. Tsoho was right in making Mr. Kanu’s dual citizenship an excuse for refusing him bail. According to Mr. Muoma, the ruling was granted as though it was the first appellant alone that made the application for bail. In its ruling however, a three member-panel, led by Justice Abdul Aboki, held that the lower court was right in relying upon Mr. Kanu’s dual citizenship, as a basis for denying his application for bail. The court said the chances of Mr. Kanu returning to his other country was high, and that the laws of his other country may prevent the trial from reaching its logical end. The court also ruled that the charge against Mr. Kanu and the other defendants was grievous and involved a threat to the state, therefore an application for bail would not be entertained. Mr. Aboki also stated that the Federal High Court acted within its jurisdiction in the said ruling, and hence affirmed the ruling of the court.